On February 1, a team of two ambitious freshmen, Nathan Engstrom and Manveer Nagra, set out to compete in the Scrambler event held at this year’s Regional Science Olympiad competition at UW-Milwaukee. The task — teams must develop, design and build a device that transports an uncooked chicken egg a distance of 8 to 12 meters along a straight course as fast as possible. The team that gets their egg closest to the wall in the shortest amount of time, without scrambling the egg, wins. The challenge — the distance to the wall is announced just minutes before launching the vehicle, requiring the teams to adjust their device on the spot. After countless hours and days of testing and modifying their device, Nathan and Manveer discovered their device wouldn’t fit through the doors of the bus the morning of competition. Already running late, Science teachers Scott Babcock and Rick Craig hastily tore the device apart in the snowy parking lot while the boys watched in horror. Unwilling to throw away months of hard work, the boys successfully re-built their mechanism when arriving to the UW-Milwaukee campus. Even more astonishing, was that during the first round, their device would perform almost perfectly, delivering their egg closer to the wall than any other competitor! 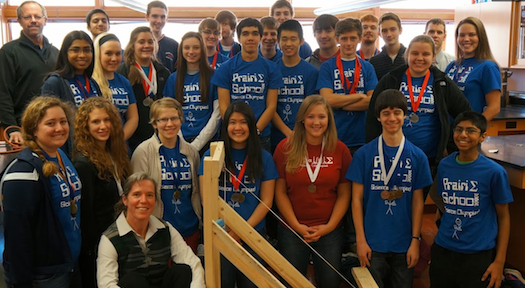 Each year, competition days are filled with successes, disappointments, and life lessons for Prairie’s young minds. Earlier this winter, 28 Upper School students gathered in U4, home to Science Teacher and Science Olympiad Advisor Jean Weaver. Preliminary instructions, a list of 28 events and pertinent deadlines were shared and discussed amongst the group of eager students. From that moment, students paired up and selected events that they would spend the next few months researching, testing, and preparing for competition. For over 30 years, Science Olympiad has challenged and exposed students to STEM disciplines across the nation. Prairie’s Upper School has participated over the last eight years, and popularity in the club continues to grow. Students compete in a wide variety of events that require knowledge of facts, problem solving ability and/or engineering design and testing. Event topics include geocaching, anatomy and physiology, diseases, water and environmental quality, circuits, geologic maps, forensics, sustainability, entomology, building various contraptions including trebuchets, bridges, gliders, and more. The entire day is spent in competition mode as teams come together fine tuning projects, supporting classmates, practicing presentations, and waiting for the results and evaluations. To date, Prairie’s Upper School team has participated in a regional competition held at the UW-Milwaukee as well as an invitational hosted at Crystal Lake High School in Illinois. Each competition draws schools with enrollment ranging from a few hundred to 1,500 plus students; Prairie most commonly is one of the smaller schools. The invitational hosted at Crystal Lake High School is known to draw in the top teams in Illinois. The invitational would showcase Prairie’s Upper School team as a team to watch for at this year’s State Tournament. A total of 41 teams participated at the invitational and Prairie came home with medals in 3 out of 23 events in the AA Division and medals in 10 of 20 events in the A Division. This year’s State Tournament will take place in April at UW Stout. Last year’s team took 8th place from a total of 50 schools, and we anticipate that this year will bring along the same success.